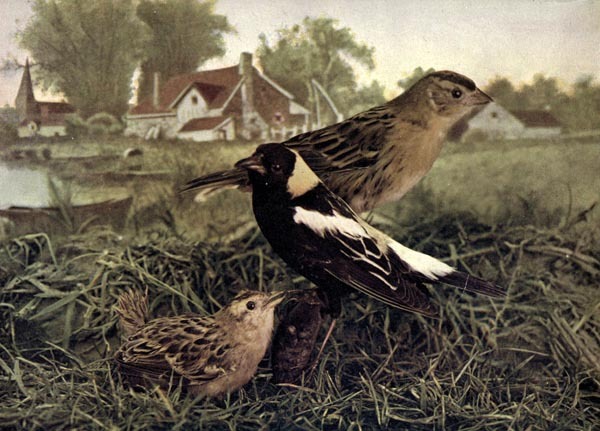 The Bobolink’s song is a peculiar one, varying greatly with the occasion. As he flys southward, his cry is a kind of clinking note; but the love song addressed to his mate is voluble and fervent. 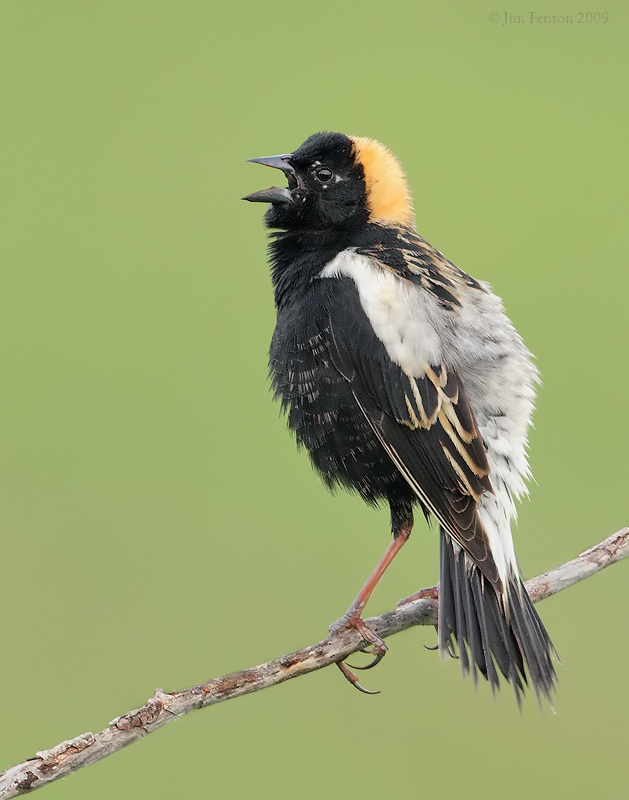 It has been said that if you should strike the keys of a pianoforte haphazard, the higher and the lower singly very quickly, you might have some idea of the Bobolink’s notes. In the month of June he gradually changes his pretty, attractive dress and puts on one very like the females, which is of a plain rusty brown, and is not reassumed until the next season of nesting. The two parent birds in the plate represent the change from the dark plumage in which the bird is commonly known in the North as the Bobolink, to the dress of yellowish brown by which it is known throughout the South as the Rice or Reed Bird. Other birds may like to travel alone, but when jolly Mr. Bobolink and his quiet little wife come from the South, where they have spent the winter, they come with a large party of friends. When South, they eat so much rice that the people call them Rice Birds. When they come North, they enjoy eating wheat, barley, oats and insects. Mr. and Mrs. Bobolink build their simple little nest of grasses in some field. It is hard to find on the ground, for it looks just like dry grass. Mrs. Bobolink wears a dull dress, so she cannot be seen when she is sitting on the precious eggs. She does not sing a note while caring for the eggs. Why do you think that is? Mr. Bob-Linkum does not wear a sober dress, as you can see by his picture. He does not need to be hidden. He is just as jolly as he looks. Shall I tell you how he amuses his mate while she is sitting? He springs from the dew-wet grass with a sound like peals of merry laughter. He frolics from reed to post, singing as if his little heart would burst with joy. 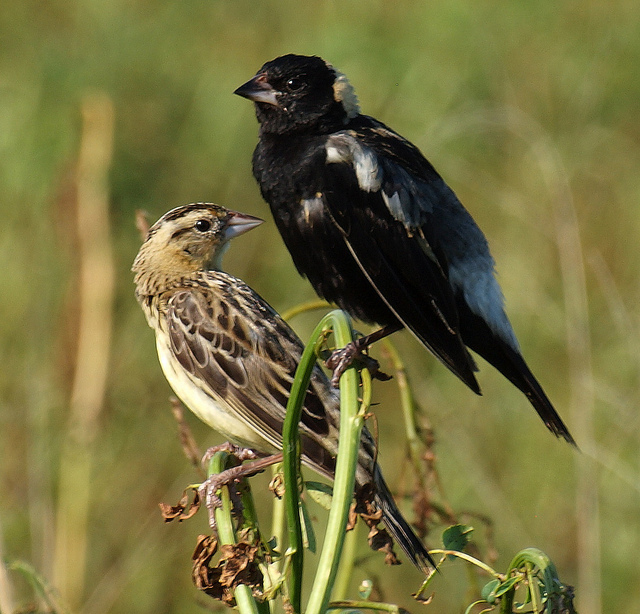 Don’t you think Mr. and Mrs. Bobolink look happy in the picture? They have raised their family of five. Four of their children have gone to look for food; one of them—he must surely be the baby—would rather stay with his mamma and papa. Which one does he look like? Many birds are quiet at noon and in the afternoon. A flock of Bobolinks can be heard singing almost all day long. The song is full of high notes and low, soft notes and loud, all sung rapidly. It is as gay and bright as the birds themselves, who flit about playfully as they sing. You will feel like laughing as merrily as they sing when you hear it some day. The Bobolink (Dolichonyx oryzivorus) is a small New World blackbird and the only member of genus Dolichonyx. They are in the Icteridae – Oropendolas, Orioles & Blackbirds Family. Adults are 16–18 cm (6–8 in) long with short finch-like bills. They weigh about 1 ounce (28 g). Adult males are mostly black, although they do display creamy napes, and white scapulars, lower backs and rumps. Adult females are mostly light brown, although their coloring includes black streaks on the back and flanks, and dark stripes on the head; their wings and tails are darker. The collective name for a group of bobolinks is a chain. These birds migrate to Argentina, Bolivia and Paraguay. One bird was tracked flying 12,000 miles (19,000 km) over the course of the year, and up to 1,100 miles (1,800 km) in one day. They often migrate in flocks, feeding on cultivated grains and rice, which leads to them being considered a pest by farmers in some areas. Although Bobolinks migrate long distances, they have rarely been sighted in Europe—like many vagrants from the Americas, the overwhelming majority of records are from the British Isles. Each fall, Bobolinks gather in large numbers in South American rice fields, where they are inclined to eat grain. This has earned them the name “ricebird” in these parts. However, they are called something entirely different in Jamaica (Butterbirds) where they are collected as food, being that they are very fat as they pass through on migration. Their breeding habitats are open grassy fields, especially hay fields, across North America. In high-quality habitats, males are often polygynous. Females lay 5 to 6 eggs in a cup-shaped nest, which is always situated on the ground and is usually well-hidden in dense vegetation. Both parents feed the young. Bobolinks forage on, or near the ground, and mainly eat seeds and insects. Males sing bright, bubbly songs in flight; these songs gave this species its common name. 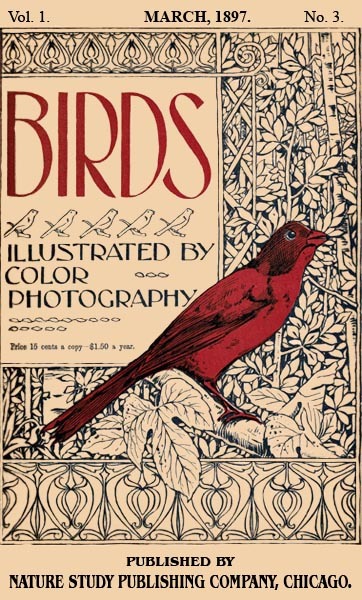 The above article is an article in the monthly serial for March 1897 “designed to promote Knowledge of Bird-Live.” These include Color Photography, as they call them, today they are drawings. There are at least three Volumes that have been digitized by Project Gutenberg. This entry was posted in Birds, Kid's Section and tagged Birds Illustrated by Color Photography, Birdwatching, Christian, From The Past, Home School, Icteridae, Kids, Nature, Photography, Rice Bird, Youth. Bookmark the permalink. One of my favorites!!! I am glad you wrote about them. We are eagerly awaiting their return this year after we “discovered” them last year. It was their song that gave them away. How we had not have noticed these beauties before, I have no idea. Papa has severe grass allergies, but he is going to do his utmost to keep from cutting our pasture this spring. Last year, as soon as the grass was mowed, the Bobolinks were silent. We did find them again a half mile away. Maybe the Lord will help Papa have less allergy reactions this year and the Bobolinks will keep you serenaded.